We’d love your help. Let us know what’s wrong with this preview of This Book Is a Planetarium by Kelli Anderson. To ask other readers questions about This Book Is a Planetarium, please sign up. Mesmerizing ! Particularly liked the Planetarium page but this book is an interesting read for kids as there's so much for them to explore ! 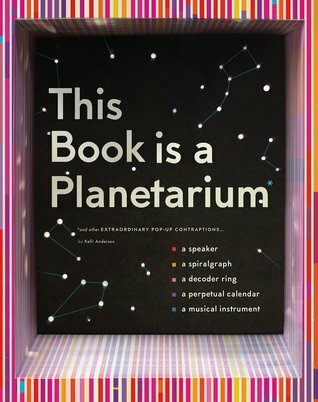 Within the pages of this remarkable book, readers will find paper pop-ups that include a musical instrument with strings and a paper pick for strumming, a decoder ring, a perpetual calendar, a planetarium for projecting constellations, a cone speaker, and a spiralgraph. Each model is fully functional and can be used by the reader to pick notes and strum chords, create [or break] a code, find any date, project a constellation and stargaze at the night sky, amply sound, or create a geometric drawin Within the pages of this remarkable book, readers will find paper pop-ups that include a musical instrument with strings and a paper pick for strumming, a decoder ring, a perpetual calendar, a planetarium for projecting constellations, a cone speaker, and a spiralgraph. Each model is fully functional and can be used by the reader to pick notes and strum chords, create [or break] a code, find any date, project a constellation and stargaze at the night sky, amply sound, or create a geometric drawing. There’s no particular relationship between the projects other than to demonstrate the diversity of the projects, and to bear witness to a few of the many marvelous things a sheet of paper can become. This pop-up book introduces readers to some of the ways in which the physical world works, encouraging them to look at the world around them in a new way, to participate in a new journey of discovery each time the page is turned. The only drawback is that, on some of the pages, the “Why it Works” printing is almost the same color as the page background, making it particularly difficult to read the accompanying text. However, readers shouldn’t let this deter them from engaging, experimenting, and experiencing all that is offered in this amazing book. Amazing. I particularly enjoy the Planetarium page but overall the entire set is really clever. It’s a great “book” to get your imagination rolling. I look forward to exploring this more when my son gets older. You don't so much read this book from designer Kelli Anderson (it's only 5 pop-up pages long) as play with it. Create a planetarium with your smartphone flashlight, strum a paper guitar, draw super cool spiralgraphs. What a fun tool/toy for kids and kids-at-heart. This doesn't count as a read as such, but I just had to document it! It's an absolutely gorgeous book with immense creativity, imagination and wondrously exciting! I love it and would wholeheartedly recommend it! Very cool! More a a series of interactive activities than a book. Really fun and interactive, especially with a crazy little brother. Better than 600 black spots! Neat pop-up book that actually has stuff you can interact with. When selecting a book by title alone, you may think that This Book is a Planetarium and Other Extraordinary Pop-Up Contraptions may be a generalization about the book’s contents. Perhaps the book is about planetariums, projecting stars, or constellations. However, in this case, the book folds out to become a rudimentary planetarium, powered by the light of a cell phone or other small flashlight. Not only is this book a planetarium, it is also a musical instrument, decoder ring, perpetual calendar, speaker, and spiralgraph. Each is made almost exclusively from folded paper or paper board, and all the advertised items are functional. As you unfold each page, easy to follow instructions appear, along with a brief explanation of the paper device. First is a musical instrument: a simple guitar with nylon strings, and a paperboard pick held in place by a sturdy paper strip. Although you cannot play actual music on the makeshift guitar, you can pluck the strings and here the different intonations created by the length and tautness of the strings. Next up is the basis of all simple cryptography: the decoder ring. The ring consists of a spinning disk with letters and numbers on it, along with a description on how to use it. Sharing the page spread is a perpetual calendar. A perpetual calendar uses similar mechanics as the decoder ring and consists of an inset disk that you spin to show the relationship between years and days of the week. For example, in 2012, January and October have a Monday that is the first day of the month. On the same setting, you’ll see that 2034 has May starting with a Monday as the first of the month. Other month/day combinations appear on the same display as well. When you get to a new month, you turn the dial, and the calendar recalibrates itself according to the year/month selection you make. A titular planetarium appears in the center of the book. This is one of the book’s more complicated paper-folding creations. On the tips of the front and back inside covers of the book are elastic bands. You can use them to loop over the interior pages of the planetarium, enabling you to keep the book open and flat. Once the pages are secured, you are invited to place a small light, such as from a cell phone, under the planetarium dome. When taken into a darkened room, your ceiling will be flooded with stars along with lines connecting the constellations. These constellations are named, but not described. The last pages contain a folding cone and stand for a cell phone. The cone will act as a sound channeling device for any noise or music created on the mobile device. This Book is a Planetarium concludes with a spiralgraph. This is a spot to place a piece of paper and hold it down with a cutout of a giant gear. On the opposite page there are 4 smaller gears stored behind thick paper straps. Each gear has many off-center holes in them. When placed in the cogs of the giant gear, over the pinned paper, you can trace a pen or pencil in any of the holes while rolling the small gear around the teeth of the giant gear. The result of this rolling is an enticing pattern of predictably wavy lines. If you keep a firm grip on the giant gear, the smaller gears will smoothly roll around creating mathematical artwork.